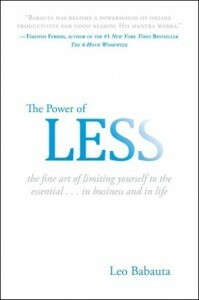 On Friday, I will be having my first book giveaway!Â Since I refuse to give away books that I do not give a positive review to, it leaves me few choices.Â Luckily, Leo Babauta (of Zen Habits) wrote a great book called The Power of Less-The Fine Art of Limiting Yourself to the Essential…In Business and in Life.Â My review-HERE. Being that I liked this book so much, I figured that it is a fitting option to be our first giveaway here at Financial Methods.Â Entering is simple.Â Leave a comment on this post, telling me how badly you want this book.Â If you feel so inclined, include how disorganized and messy your organizational skills are.Â It will not help you win the book, but I like to be entertained just as much as anyone.Â Do not forget to include and email address in the comment, so if you win, I can reach you. Really, that is all it takes!Â I am not going by subscribers or twitter followers, so be sure to comment to win. I will drawing a random comment number on Friday evening, so be sure to enter right now! The random number generator at Random.org tells me that #4 is the winner!Â Congratulations, Tooch!Â It’s all yours! Thanks for running this contest! I love Leo’s stuff and his blog is what got me into blogging to begin with. Having said that, I’m a pretty organized person. However, what I have trouble with is simplicity and knowing when enough is enough, which is why I read Zen Habits. I would love to read this book too! Wow, I have a 50% shot! Awesome! Love Leo’s blog but I’m too frugal to pick up the book, and haven’t made it to library lately. I would love to read it. Despite most people calling me organized, I’m not! I need all the help I can get! My house so messy, I don’t invite people over. My roommate mows my yard and washes my dishes, because otherwise it wouldn’t get done. It’s often easier to sleep on the couch, because there’s too much stuff on the bed. I only wash clothes when I run out of clean clothes to wear. I can’t find stuff and am unsure where to look. I like to write music, but I can’t reach my instruments through the clutter. I want to sell some of my crap on Craigslist, but I’m too busy reading blogs. I’m a person of EXCESS. borderline hedonism. I wheel around my office all day on a custom swivel chair because ‘walking is for suckers’. I find myself taking the elevator even when it’s not needed. I only eat at buffets since I prefer to measure my food intake in units of time and not weight or portion size. I have 7 cars…one for each day of the week. And i change my clothes in exact time with ‘local on the 8’s’ on the weather channel. I feel i deserve this book to help me live a life of less. Please send me this book….hand delivered by no less than 5 women dressed in toga’s….in a symbolic gesture to my old life of ‘more’. Previous post: HelpWithMyCredit.org-Legitimate Credit Assistance?